Day 1: Fly from London Stansted Airport to Copenhagen. Even though our flight left extremely early, we still didn't arrive at our apartment until mid-day. The boys were exhausted, so off they went to nap while we settled into our apartment. Later that afternoon, we had a snack at Botanisk Have (the botanical gardens) and then walked to Rosenborg Slot. 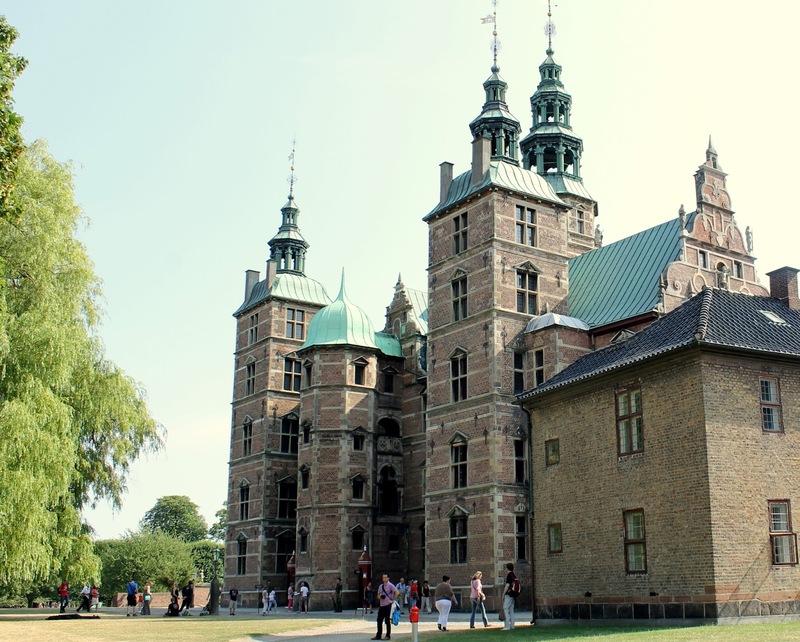 Rosenborg Slot is a towering castle, built as a summer residence for Christian IV. We didn't go inside, and instead enjoyed the sunshine and admired it from the outside. It is surrounded by Kongens Have (King's Garden), a vast and green park area perfect for picnics. It has a wonderful playground for young kids, too. So you can easily fill a 1/2 day here if you did go inside the palace. 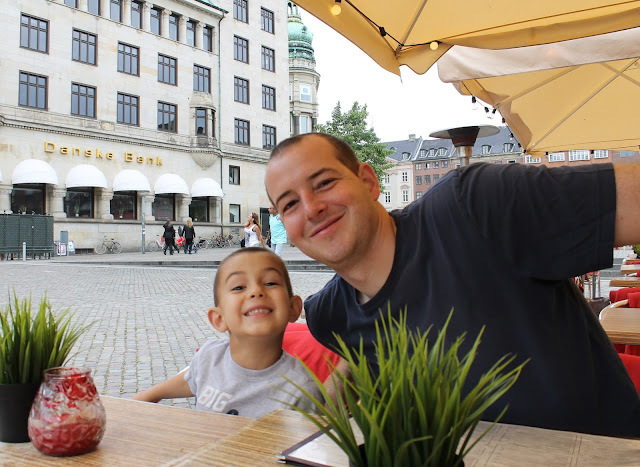 You can read more about our time at Rosenborg Slot and Kongens Have here. Day 2: We ate breakfast in and wandered around the Latin Quarter. Be sure to mark this area on your map, as it has several large squares surrounded by cafes that are perfect for dining with young kids if the weather is nice. After leaving the museum, we stopped at the Lego store in the bustling Stroget shopping area. (While Legos were invented in Denmark, the staff at the store tell me they sell the same products at this shop that you'd find anywhere else.) Even if you're not interested in shopping, this is a lively street with cafes and street performers and it is a fun place to stroll. It's also pedestrian-only if the kids are ready to break free from the stroller! Later that afternoon, we played at Orstedsparken (a park near our apartment) and went out for gelato. 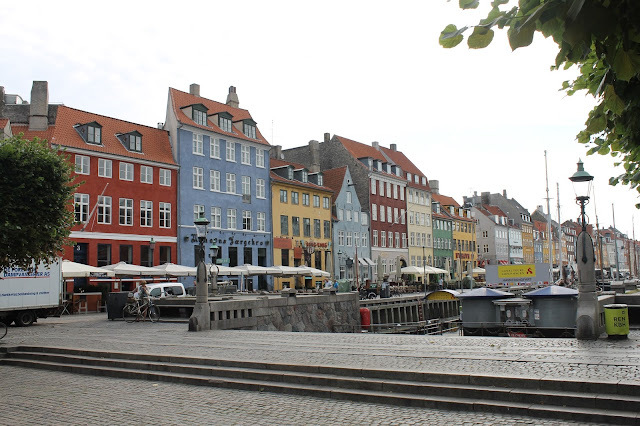 Day 3: We walked to the Nyhavn harbor area first thing in the morning, and then took an hour-long harbor cruise. My husband and I enjoyed the cruise the most out of all that we did in Copenhagen. From the boat, we saw many of the famous Copenhagen sites, including Amalienborg Palace and The Little Mermaid statue. After the cruise, we returned to Kongens Have to have a picnic for lunch. 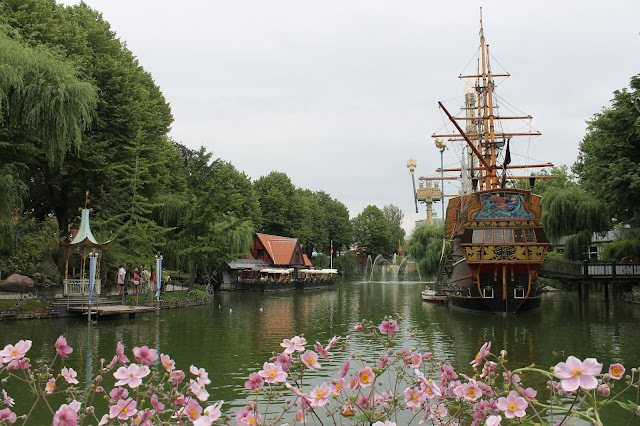 That afternoon, we spent several hours at Tivoli Gardens, including dinner on a pirate ship. I'm not much for amusement parks, but Tivoli is truly a charming place. I can see why Walt Disney decided to undertake his own parks after being inspired by this place. Bring a great stroller. We didn't look into bus transportation, but the metro stops are spaced quite a distance apart. For that reason, it just made more sense to walk everywhere. Plan to picnic. Dining out in this city is extremely expensive. You'll spend at least a $100 for four people if you're going to sit down and have a server somewhere. In general, we ate out once each day and either cooked in our apartment or bought picnic fixings for our other meals. Skip The Little Mermaid. I was glad we got to see it from the water on our harbor cruise, but it was mobbed with tourists from the cruise ships that dock nearby. If you're walking around the city, it's quite a hike from the main tourist areas. 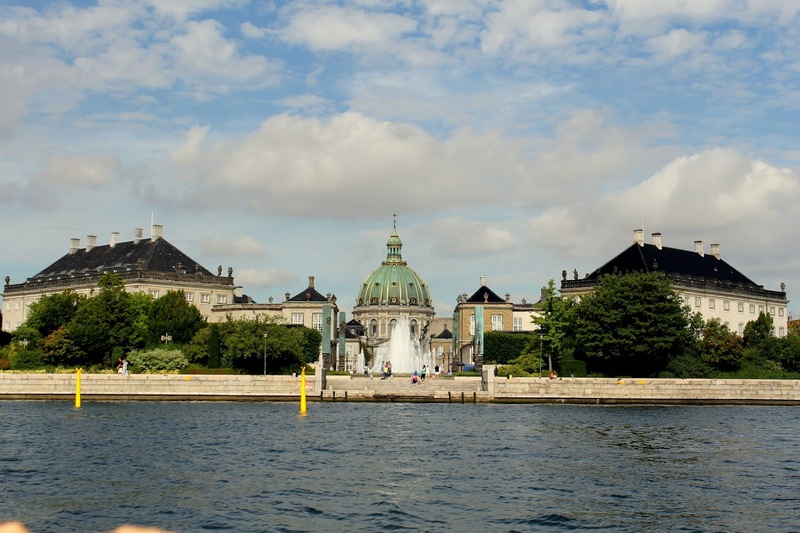 Amalienborg Palace looked beautiful from our harbor cruise. I wish we had time to at least admire it up close from the ground instead of just from the water. Visit a beach. I had researched a beach just a quick Metro ride away at Amager Beach Park. It would have been fun to let the kids loose on a beach for a bit and take a break from urban sightseeing. 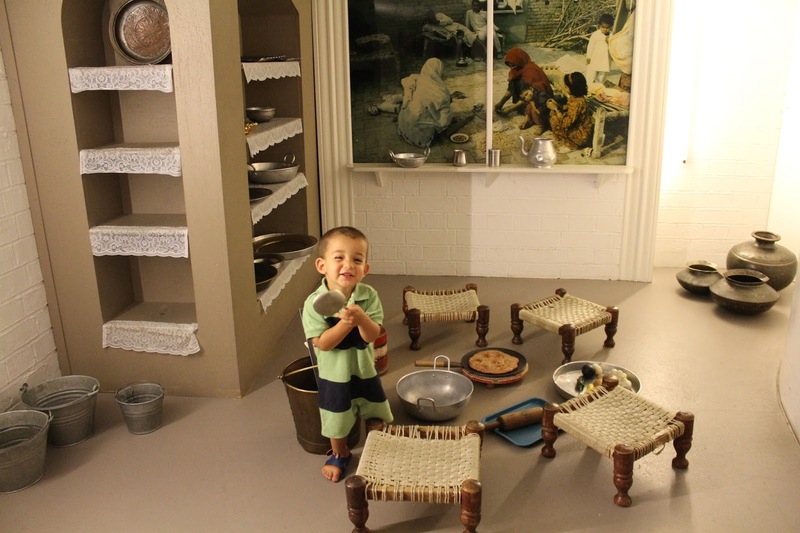 There were many more museums to see, but given the beautiful weather, we couldn't resist doing more outdoor activities.